Tudor Place is a beautiful 18th century home hidden among the historic townhomes of Georgetown in Washington DC. Once you could see the Potomac River from the rear portico, but now the sweeping views have been replaced with homes, high end stores, and restaurants. The streets are usually filled with tourists and locals on the weekends looking for Georgetown Cupcakes or the latest styles at Ralph Lauren. 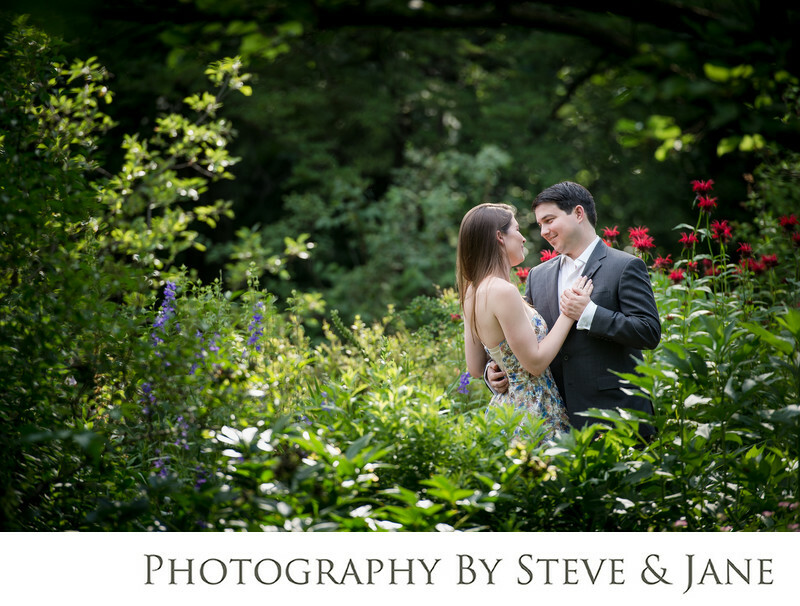 Instead of fighting the weekend crowds, this couple made reservations to have their engagement portraits in the mansion's gardens. Paths wind through roses, vines, and other perennials that thrive in the humid Mid-Atlantic climate. Tall trees that pre-date many of the homes in the area give ample shade and respite from the summer heat. In the late afternoon, light streams through the greenery giving a magical dreamy feel to this couple's photos. Tudor Place is not only available for engagement sessions by appointment, but it's also a wedding venue. Most couples choose to say their vows on the lawn near the fountain. It can accomodate around 70 guests. Close to many hotels and like the classic and stately Ritz Carlton and the luxury boutique hotel, The Graham, there are many places for your guests to stay and enjoy the city. Georgetown is also home to some of the city's finest dining experiences. Fiola Mare has been one of the top rated restaurants and even President and Michelle Obama dined there during his years as the head of our nation.